Local Jewellers David Mellor are offering a £1,000 reward for information after an £8,000 Rolex Sea-Dweller watch was nicked from the Swan Centre. 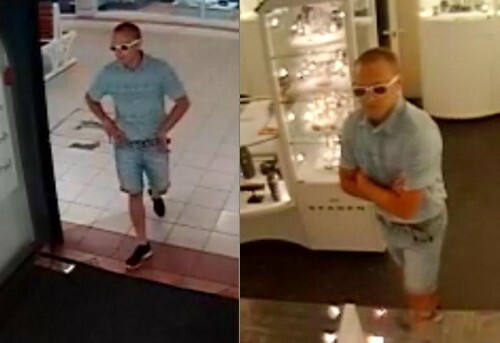 Police in Eastleigh have released a CCTV image of a man they would like to speak to in connection with the theft of the stainless steel timepiece on Tuesday afternoon. At around 3.50pm on July 29, a man asked to try on the watch before leaving the store and the shopping centre via Blenheim Road.. Wearing a pale blue coloured buttoned up short sleeved shirt and three quarter length jean shorts. He was also wearing distinctive white coloured Ray-Ban sunglasses. The reward is for information which leads to a successful conviction in relation to this theft. You can also call the charity Crimestoppers line on 0800 555 111 where information can be left anonymously.